Photovoltaics are best known as a method for generating solar power by using solar cells packaged in photovoltaic modules, often electrically connected in multiples as solar photovoltaic arrays to convert energy from the sun into electricity. To explain the photovoltaic solar panel more simply, photons from sunlight knock electrons into a higher state of energy, creating electricity. The term photovoltaic denotes the unbiased operating mode of a photodiode in which current through the device is entirely due to the transduced light energy. 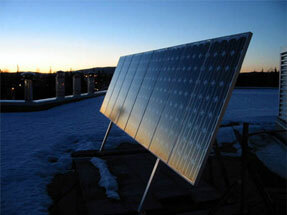 Virtually all photovoltaic devices are some type of photodiode. Cells require protection from the environment and are packaged usually behind a glass sheet. When more power is required than a single cell can deliver, cells are electrically connected together to form photovoltaic modules, or solar panels. A single module is enough to power an emergency telephone, but for a house or a power plant the modules must be arranged in arrays. Although the selling price of modules is still too high to compete with grid electricity in most places, significant financial incentives in Japan and then Germany triggered a huge growth in demand, followed quickly by production. Perhaps not unexpectedly, a significant market has emerged in urban or grid-proximate locations for solar-power-charged storage-battery based solutions. These are deployed as stand-by systems in energy deficient countries like India and as supplementary systems in developed markets. In a vast majority of situations such solutions make neither economic nor environmental sense, any green credentials being largely offset by the lead-acid storage systems typically deployed.